As student unrest builds on college campuses and higher education workplaces struggle to push the needle to more diverse leadership, NACUBO initiates programming to guide stakeholders in understanding and tackling the issues. Diversity and inclusion are everyone’s business,” asserted Mary Ontiveros, co-presenter of the webcast, “The CBO’s Role in Diversity and Inclusion on Campus.” Ontiveros, vice president for diversity, and associate vice president for enrollment and access at Colorado State University, joined Gerald Hector, vice president for financial affairs at Cornell University, to launch NACUBO’s first in a series of professional development offerings focused on diversity and inclusion—and the CBO’s related roles and responsibilities. With chief business officers playing an important role in the president’s cabinet, they are involved in many conversations about the campus as a whole. While the scope of the CBO’s duties focus mainly on financial issues, the position often touches areas that are related to changing demographics and dynamics, management of buildings and grounds, human resources issues, and campus safety and security. Recent student demonstrations, the need for campus safe places, and much more, shed light on the need for increased dialogue and action for all campus leaders. 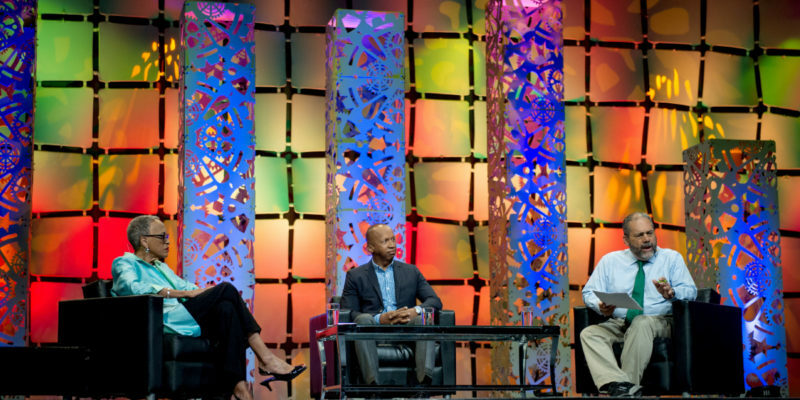 NACUBO followed its conversation starter on the challenges impeding diversity and inclusion with a general session at the 2016 Annual Meeting in Montréal, “A Dialogue on Diversity.” Featuring journalist and speaker Ray Suarez; formidable leader in education and the arts Johnnetta Cole; and unrelenting activist and lawyer Bryan Stevenson, the three-person panel reflected on the importance of understanding our differences, how higher education institutions can better embrace their diversity and inclusion issues, and the power of education to influence that dialogue and its impact. Read some of the highlights of the discussion and follow-on conversation in the pages that follow. To further dig down into the impact of campus unrest resulting from students’ sense of inequality and discrimination, NACUBO invited Janice Abraham, president and CEO of United Educators, to interview two campus leaders who deal directly with such turmoil on a regular basis. As a trustee for two independent institutions, Abraham’s questions include what role governing boards might play in addressing student concerns. In the following “On Balance” interviews, Felicia McGinty, vice chancellor for student affairs, Rutgers, The State University of New Jersey, describes the importance of proactively engaging students; and Mary Ontiveros, vice president for diversity, Colorado State University, details her institution’s strategy for building an inclusive community. Johnnetta Cole (left) insists that our society can change. 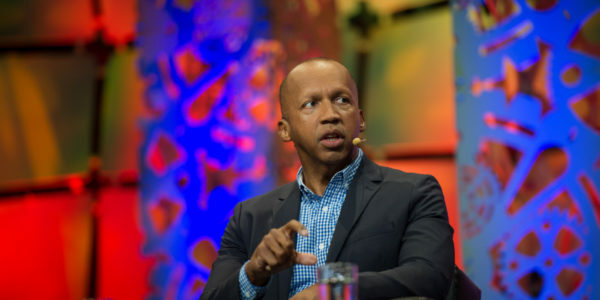 Bryan Stevenson (center) and Ray Suarez agree that advancing an inclusion agenda requires taking risks and stepping out. 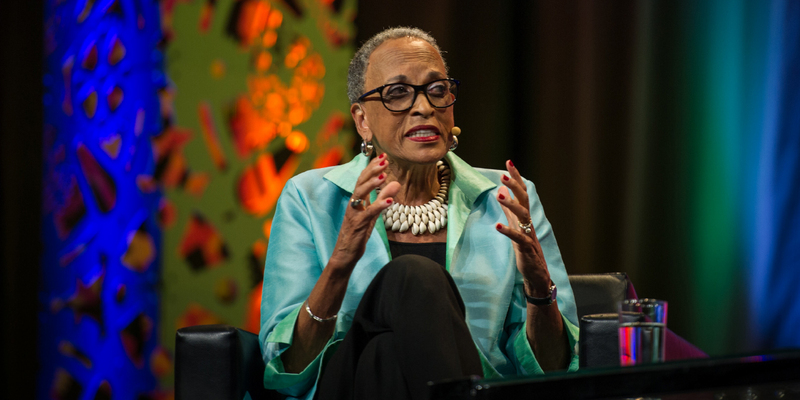 During the Diversity Dialogue at the NACUBO 2016 Annual Meeting in Montréal, well-known leaders of color articulated strong opinions about the state of college campuses and that of larger society. Informed by painful, discriminatory experiences in their own lives, panelists’ comments focused on persistent inequality and ways that education can guide a more just future. Cole went on to say that she spends most of her time in the art world, where museums attract visitors of whom only 9 percent are people of color. Suarez responded by saying that numbers seem to move things along when nothing else does. “The argument for doing something different, or our society will be the poorer for it, can be supported by the fact that only 10 percent of Latinos have a college degree, yet by 2025, if growth of this demographic continues as before, the country will be home to 135 million Latinos.” At our current level of college completion, said Suarez, this equates to a huge amount of underutilized talent. Panelists agreed that a major issue in the diversity and inclusion world is that we really think that we can relate to each other, but we have so many different identities. Stevenson was less hopeful: “I feel so deeply, because we live in a time that we need to really improve justice. I’ve seen our country move in some troubling directions. We had six million people on parole, in 2015. We’ve done some terrible things. We’ve had a 640 percent increase in incarcerations; 70 percent of women in prison are single mothers with children with nowhere to go. A full 31 percent of the male population of Alabama is no longer able to vote.